BLADE RUNNER HAS been one of my favorite movies since the first time I saw it. I’ve always hoped that I would get chance to see Blade Runner on the big cinematic screen, but hadn’t really believed that an old 1982 movie would get big screen time. But suddenly the chance came up, as BioCity in Århus arranged a special marathon, dedicating one show room for continuously playing Blade Runner – Final Cut at all time slots for almost an entire week. The sensation was enhanced by the fact that the movie was projected from a digital copy with a high resolution projector. What a fantastic picture quality! This was the first time I’ve seen a digital movie projected at the cinema – and what a debut experience with such a picture-beautiful movie as Blade Runner. This is how movies should be seen. Definitely worth the almost 150 kilometer drive. 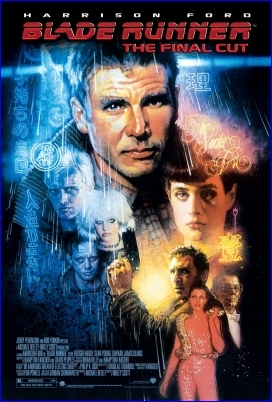 I was looking for a Blade Runner poster/cover for the Final Cut and chanced upon your site. I read your thoughts on the film and enjoyed what I read. Although Blade Runner is my favourite film of all time, I have never seen the it on the big screen, and I imagine it must be quite a treat, I envy the fact you’ve seen it this way and admire that you drove 150kn to see it! I agree that it is one of the best films of all time and great that it continues to entertain audiences. Ridley Scott must feel vindicated after the troubles he encountered from the movie studio, producers and some cast members, notably Harrison Ford who only recently spoke on camera about his experiences on the film set during filming for the frist time! Ridley Scott is a great visionary that has made a film that offers stunning visuals, an engaging story line and superb music, a must-see movie.